The following examples show typical swim technique limitations that were clearly identified with an Aquanex analysis. In each example, the vertical gray lines on the force curves are synchronized with the video image. The butterflyer begins her pull by moving her hands away from her body. Her arms move through a weak range of motion and she generates less than 30 N about 6 (lbs) for .2 sec. The backstroker fails to finish her push phase with her hand moving closer to her body and into a stronger position. Consequently, her hand force rapidly drops. The breaststroker failed to flex her elbows enough so that her arms would be in a strong position to increase force over the entire stroke. 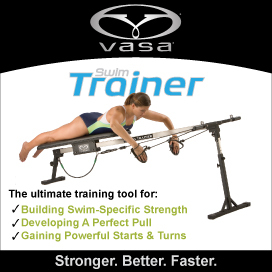 Because her arms are almost straight, she is not able to increase force as she makes the outward to inward scull transition. The freestyler has a force loss as he makes the pull to push transition. He rapidly flexed his elbow as his arm passed under his shoulders producing a 60 N (13 lb) force loss on every stroke.